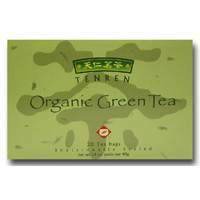 Organic green tea is grown without chemicals and with careful attention to the preservation of the ecosystem. TenRen's organic green tea has been certified by an independent third party agency and comes from a region known for the finest green teas. Since this tea is organic, the green tea's antioxidant properties and health benefits may be enhanced. Our organic green tea is not only good for your health but is also good for the earth.